- Basic to advanced information about marine fish & reef aquariums. A growing resource with set up, aquarium lighting, chemistry, filter information too. 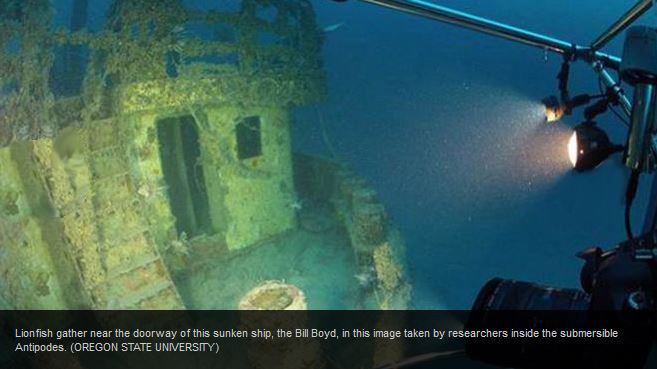 Researchers say they found the venomous invader thriving around a sunken ship at 300 feet below the water's surface. "We expected some populations of lionfish at that depth, but their numbers and size were a surprise"
Last month, Green and colleagues investigated the seafloor near Fort Lauderdale, Fla., in a deep-diving Antipodes sub. At 300 feet deep, the team witnessed a large number of the spiny fish near the intentionally sunken Bill Boyd cargo ship, an artificial reef created in 1986. While lionfish are typically between 12 and 15 inches long, the Oregon State researchers say they saw unusually large specimens as big as 16 inches long. Stephanie Green noted: "This was kind of an 'Ah hah!' moment. It was immediately clear that this is a new frontier in the lionfish crisis, and that something is going to have to be done about it. Seeing it up-close really brought home the nature of the problem." Native to tropical Indo-Pacific waters, lionfish were introduced to the Atlantic by humans in the 1990s, likely through the exotic pet trade. Now found in reefs from North Carolina to South America, the rapidly reproducing invasive fish have voracious appetites, gobbling up native fish and competing with other species for food resources. Worse, lionfish have no natural enemies in Atlantic waters, except spear gun-toting humans. Another study, detailed online July 11 in the journal PLOS ONE, found that not even sharks can curb red lionfish populations in Caribbean reefs. Researchers are trying to figure out what is keeping lionfish in check in the Pacific so that they might stem the Atlantic invasion, which thus far has looked to be unstoppable. Prepared correctly, lionfish are said to make a tasty meal, but one prick from the fish's venomous spine can cause excruciating pain. Lionfish derbies to bring in big catches of the predator have been held in Florida and the Caribbean. Stephanie Green also noted: "A lionfish will eat almost any fish smaller than it is. Regarding the large fish we observed in the submersible dives, a real concern is that they could migrate to shallower depths as well and eat many of the fish there. And the control measures we're using at shallower depths — catch them and let people eat them — are not as practical at great depth." Lionfish also can produce far more offspring when they are large. A big, mature female in some species can have up to 10 times as many offspring as a female that's half its size, researchers say. Not too much I can say here other than as a person who has kept many Lionfish (& have been stung by them), in particular this species, one needs to be aware of the native waters and what can live or not by dumping your fish in the ocean, rivers, lakes, etc. Obviously in the case of these tropical Lionfish, these would not survive even a short while in the waters off the coast of Oregon due to the temperature of our coastal water, but even then dumping these fish would still be a cruel way to dispose of your unwanted pets. A small skiff was found washed ashore near Long Beach, Washington in March 2013. This skiff contained 5 knifejaw or striped beak fish, a palm-sized fish tropical fish. The Washington Department of Fish & Wildlife euthanized most of them, out of likely misguided fears that the fish would become an invasive species (these are a TROPICAL fish, unlike the ocean waters of Washington State). However one of the black-and-white striped fish was taken to the Long Beach City Hall where employees there in turn called the Seaside Aquarium, which came to the rescue. 200 North Prom, Seaside, Oregon 97138 Tel: (503) 738-6211. This skiff was possibly lost in the Japanese tsunami in March of 2011, the boat reportedly has a registration number from a region where the tsunami hit (not as yet confirmed by the Japanese government). The boat also contained several other forms of sea life including marine worms, crabs, scallops, a sea cucumber and marine algae, making it a reasonable substainable miniature ecosystem for the fish but for the temperature. 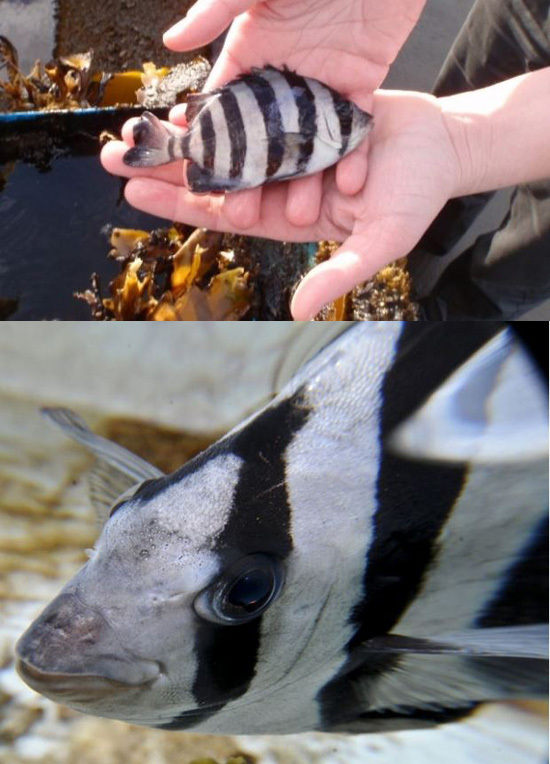 Considering the stripes on this particular rescued striped beak fish, it is likely this fish is immature. Mature beakfish turn a charcoal grey, and are considered a prized food fish in Japan. Size; 80.0 cm, 31 inches. Weight; at maturity 6.4 kg, 14 lbs. Distribution; Northwest Pacific: Japan, Korea, Taiwan. Eastern Central Pacific: Hawaii. Thank you for taking the time to check out Grants Pass Aquarium, located in Oregon. Our aquatic roots started in 1968 and have only expanded with professional experience in many aspects of aquarium and pond keeping. We have had experience in owning full pet stores and professional aquarium maintenance. Our time has expanded us to a full team of people continually trying to improve this hobby by helping with our experience. Our current focus is one of the largest professional aquatic libraries on the internet. All through American Aquarium. This library grows daily with new content in the form of articles and videos. We even ongoingly update each of our articles to keep up with this changing hobby and industry. This site is dedicated to local news about aquatic life, professional information, and help with aquarium maintenance. We take a professional approach to aquarium keeping and have used our experience to understand many indepth aspects. A lot of our work has also focused on aquatic resources based on factual science and real world experience. We even have spend lots of time preforming experiments not commonly done. We are here to help with aquarium understanding. We help people international understand and become better aquatic keepers. On top of online help, we have access to a full product resource store, with equipment recommended by real aquarium maintenance service people in today's industry. We also offer local aquarium maintenance help, were we can be consulted for some extra help or we can fully take over the maintenance of your aquarium. We've had and currently have a whole array of aquariums and ponds we service. Ranging from home planted tanks, doctor offices, and clients such as Disney. Please also make sure to check out our backing and full support, which allows us to have a successful aquarium maintenance company. It's the work done over at American Aquarium, which makes everything happen. The most professional and content loaded aquatic retail site on line. Please contact us though email at this time, as our service schedule is packed and we are consistently helping people either face to face or over the internet.